The growing demand for natural resources has put the subject of raw materials back onto the international political agenda. 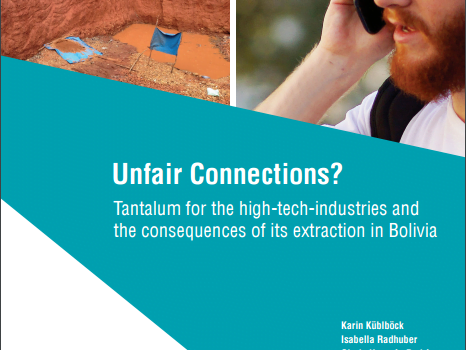 On the one hand, increased competition over access to and control of these resources has led a number of industrialized countries as well as the European Union to formulate specific raw material strategies (Küblböck 2013). On the other hand, some resource-rich countries have taken measures to increase earnings from the extractive sector in order to promote the development of their own local and national economies. On the international level, a number of initiatives has arisen to increase transparency and accountability in the sector (Küblböck/Pinter 2015). At the same time, criticism of and resistance to mining projects continues to increase in many regions. In this context, most notably in Latin America, a debate concerning social and economic alternatives to resource extraction has developed in the last decade (Heinrich Böll Stiftung 2015, Brand/Dietz 2014). In 38 countries worldwide the extractive sector is of such high importance that it represents more than 25% of export revenues, or at least 20% of the gross domestic product (GDP). 31 of these countries fall into the two lowest income groups (“low income country” or “least developed country”).